Before your survey is distributed, we strongly recommend that you preview and test it. This gives you the opportunity to review all aspects of your survey design, including spelling, layout, answer choices, skip logic, etc. You can even send the link to others, such as colleagues, friends or family memebrs, to review your survey before you officially launch it. The blue Preview Survey button at the top and bottom of the survey on the Survey Design page. 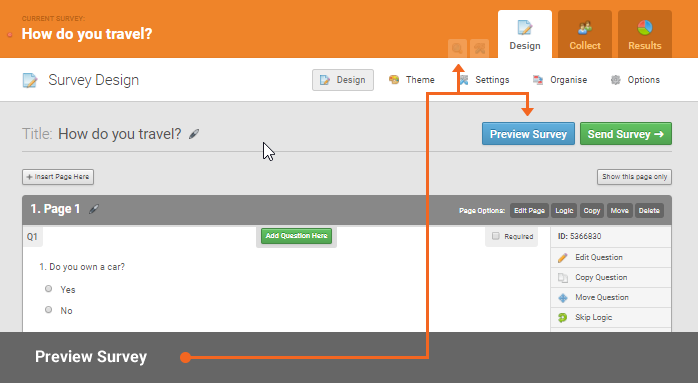 By clicking the faded Magnifying Glass button in the orange bar to the left of the Design, Collect and Results tabs. The survey preview will open in a new browser window. There will be a pop-up telling you the survey is in preview mode. The black bar at the top of the screen also indicates this. The icons in the upper-right corner of the screen allow you to preview the survey as it would appear to users on Desktop, Tablet, or Mobile devices. There is also a drop-down in the upper right corner so you can navigate to specific pages in the survey. Interact with your survey as you would expect your respondents to. Click Finish Survey to see the final page. Close the browser window to close the preview. Results will not be saved in Preview Mode - When you preview a survey, your answers are not saved, and no data will be submitted when you click Finish/Submit'.